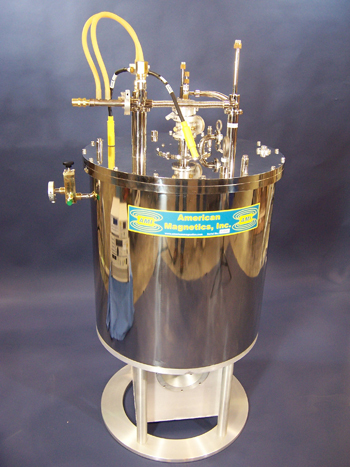 American Magnetics, Inc. offers a wide selection of cryostats and cryostat related equipment. A cryostat is a vessel used to maintain cryogenic temperatures and is categorized as a liquid cryostat (referred to as a dewar) or a conduction-cooled (cryogen-free) cryostat. These vessels are vacuum insulated and are constructed of non-magnetic materials with copper or aluminum thermal shields. All non-demountable joints are inert gas welded providing a rigid, mechanically strong cryostat for long and reliable use. All joints are checked with a helium leak detector at every stage of construction, and vacuum integrity is guaranteed for one year. The completed cryostat is temperature cycled and tested to confirm that it meets AMI's high standards for quality. 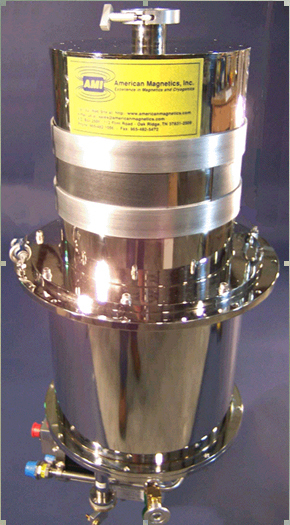 Cryostats are generally supplied with a reliable evacuation valve, a safety pressure relief valve and provisions for mounting a thermocouple gauge for monitoring the cryostat vacuum. 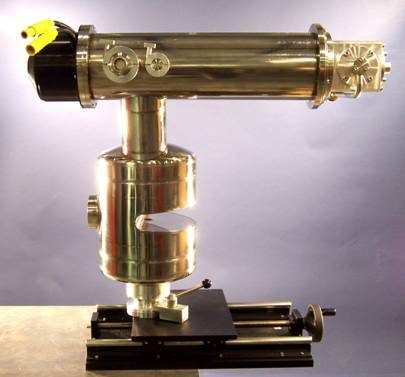 Cryostats can be provided with a mounting flange, lifting lugs and other options to meet the customer's handling and interface requirements. 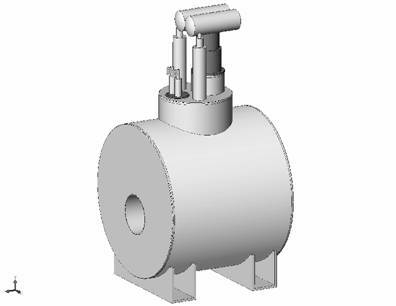 AMI has the capability to design and manufacturing these cryostats and can provide customized designs tailored to our customer’s specific requirements. AMI supplies liquid helium dewars in several configurations. 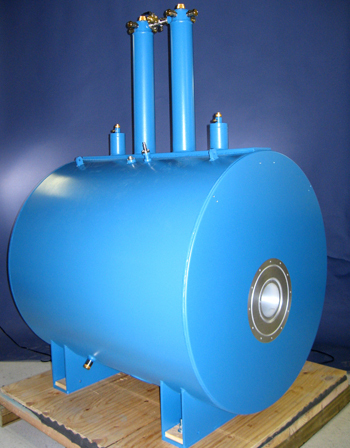 AMI dewars are designed for minimum liquid helium consumption and both liquid nitrogen (LN2) and vapor-cooled shielding are available. LN2 shielding offers a stable shield temperature, low helium losses, and minimal dewar thermal stabilization time. Vapor shielding uses the helium boiloff vapor to cool the shields, provides low helium losses and eliminates vibration issues sometimes associated with LN2 shielded dewars. The bucket dewar is the simplest and lowest cost dewar offered. The magnet and insert/support assembly are installed vertically as a unit and mounted on a flange at the top of the dewar. The bottom-loading dewar has a flanged access at the bottom ends of the vacuum vessel, shields, and helium reservoir. This allows for installation of a large magnet into the dewar while keeping the neck at a small diameter to minimize helium losses. Bottom-loading dewars can also be provided with optical access ports in multiple axes. 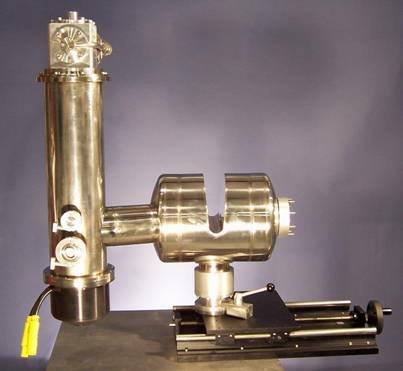 The recondensing dewar provides a near-zero loss system by utilizing a closed-cycle cryocooler to recondense helium boiloff. This dewar style can extend the time between liquid helium refills for several months to a year or more. These dewars can be provided with GM or pulse tube cryocoolers. AMI can design and manufacture custom dewars to meet our customer’s varied needs. 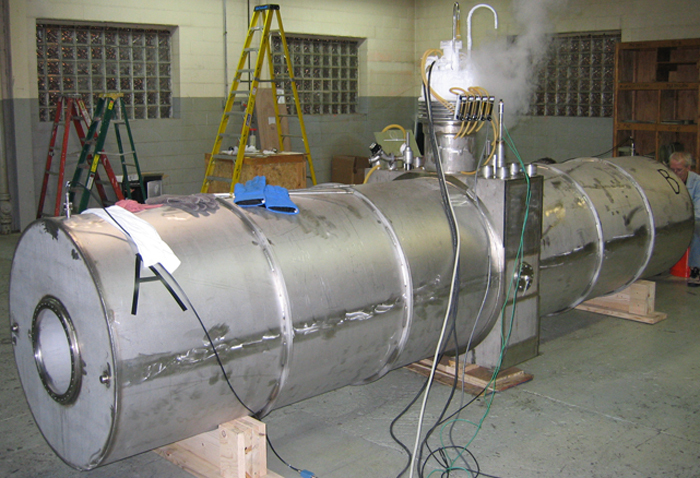 Conduction cooled (or cryogen-free) cryostats offer continuous superconducting magnet operational without the cost or safety issues associated with liquid systems. 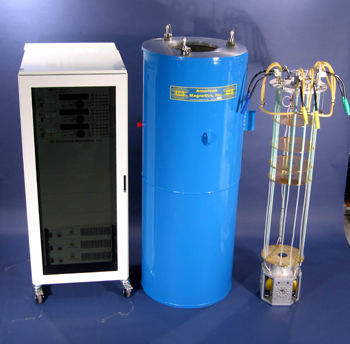 Conduction cooled systems can replace most conventional liquid liquid helium cooled magnet systems if a compact system is required, or if liquid cryogens are undesirable or unavailable. Current leads constructed with High Temperature Superconductor allow high operating currents with very low heat losses. These cryostats are provided with either GM or pulse tube cryocoolers and can be designed to operate in multiple orientations.